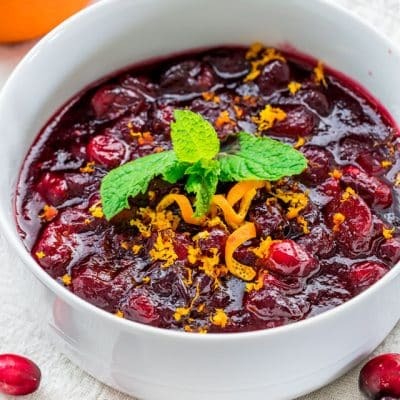 World’s Best Cranberry Sauce – Your Thanksgiving table is not complete without this cranberry sauce made from scratch. A hint of nutmeg, lots of orange zest and a bit of vanilla complete this incredible cranberry sauce. Perhaps it may be a bit presumptuous of me to name this recipe world’s best cranberry sauce, but it wasn’t me that decided upon this name but everyone who has tried this recipe, so that name stuck. And trust me when I say that it is incredibly delicious, and I’m not usually a fan of cranberry sauce, but I can’t stop eating this one. Neither could hubs, and he couldn’t stop boasting about how good it was. As I said, not a big fan of cranberries here whereas my husband can eat them raw right out of the bag. I simply can’t understand that, I need lots of sugar on my cranberries before I can eat them. For example, I love sugared cranberries, or I love this cranberry sauce but could never eat them raw because of their tartness. 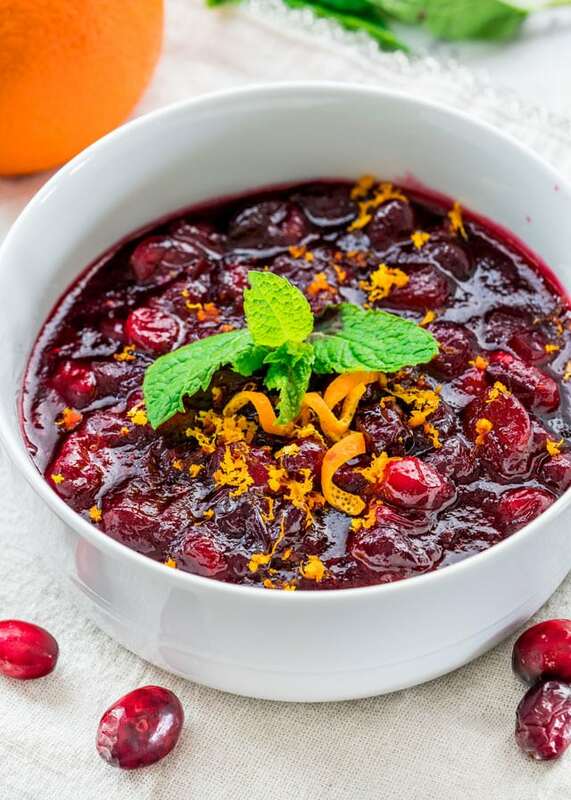 This cranberry sauce is extremely simple to make and it’s made with ingredients you probably have in your pantry right now. 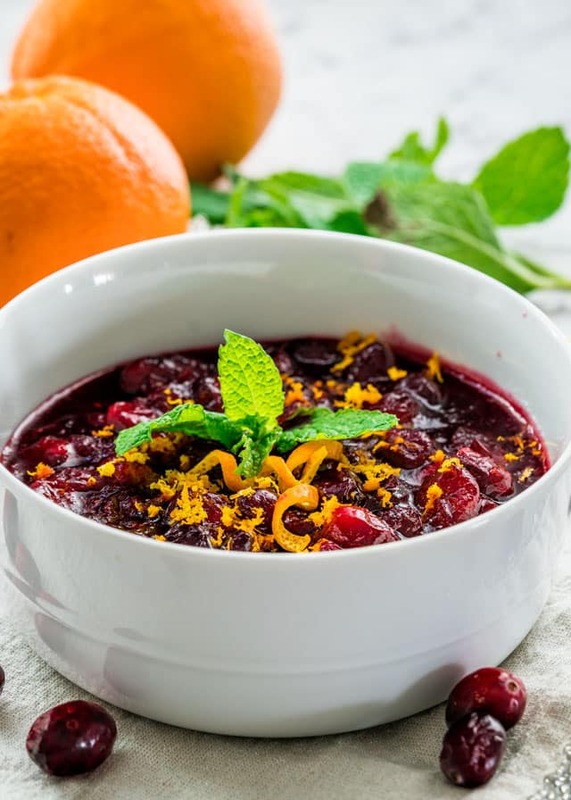 We’re talking sugar, you need lots of sugar to balance out the tartness of the cranberries, orange juice, because I just love the combination of cranberries with orange juice and lots of orange zest. I also added a pinch of nutmeg, because it’s the holidays and nutmeg is a must in almost anything, plus it adds that nice nuttiness to the sauce. Then the last ingredient I added which was almost an afterthought was a bit of vanilla extract, but gives the sauce that homey vanilla smell which again smells like the holidays for me. You cook this on medium heat for about 10 minutes, and at the end you end up with the perfect cranberry sauce. Of course other ingredients can be added like some chopped pecans, which I have done before and it was really nice, you can also add some raisins or other spices like cinnamon. However, this is my basic cranberry sauce which you can’t go wrong with. It really is delicious and a must on every Thanksgiving table. CAN I MAKE CRANBERRY SAUCE AHEAD? Absolutely! Cranberry sauce when stored properly can last up to 2 weeks in the fridge, which is why this is perfect for making ahead. Anything we can do to save time for the big holiday is a bonus! Your Thanksgiving table is not complete without this cranberry sauce made from scratch. A hint of nutmeg, lots of orange zest and a bit of vanilla complete this incredible cranberry sauce. Add all the ingredients to a smaller pot and stir to combine. Turn the heat to a medium-high and bring to a boil, stirring occasionally. Reduce the heat to a medium and continue cooking for about 10 minutes, stirring occasionally. You will notice the cranberries will burst as they cook. Let cool completely at room temperature before serving. Store the cranberry sauce in a bowl wrapped with plastic wrap or in an airtight container in the refrigerator for up to 2 weeks. Please note the sauce will thicken as it cools. Other optional ingredients to add to the sauce are pecans, raisins, cinnamon. This recipe is great! Thanks! I used it this Thanksgiving and the cranberry sauce was a big hit! Is it a must to store it once made for up to 2 weeks? I’d like to make it and serve it the same day since I waited until the last minute to make dinner. That’s just a tip on how long it will last in the fridge before going bad. This recipe is meant to be served right away. Would you think I would be able to add two apples to this recipe without changing the other ingredients? That would taste great! You can add a bit less sugar if you don’t want it to be too sweet with those apples. The recipe turned out amazing, I loved how easy it was. Delicious! Any suggestion if OJ with or without pulp is best? Looks delicious! Whatever you prefer, I used without. 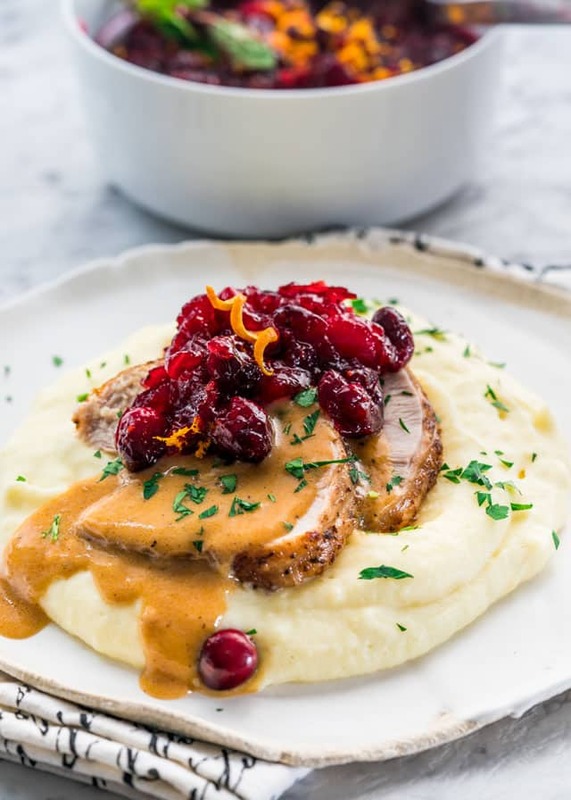 Hi, I’m really interested in making this but I’m curious where, if there is one, the recipe for the turkey and gravy in the photo is? The gravy looks amazing, I just had to know what was in it. I love the way you explain everything, your recipes are so clear and so foolproof that it is impossible for me to think they will go wrong! Thanks for the confidence!!! Do you think I could improve the slices a bit, trying to make it tender letting it simmer in a more a neutral sauce or some kind of marinate that “breaks” a bit the fibres in the cooked meat? Thanks and a big kiss from Barcelona!